This unique program consists of three baroque compositions for solo violin, baroque chamber orchestra and basso contitnuo. Pavel Šporcl plays virtuosic compositions of old masters on his modern violin in baroque tuning ( half-step lower) and talks about Italian renessaince and the times of Louis XIV of France. 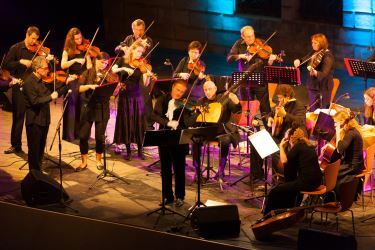 The soloist is accompanied by magnificent ensemble of baroque music intsruments - The Czech Enesemble Baroque Orchestra. This project was presented in the International Festival Smetana´s Litomyšl and Music festival Znojmo.